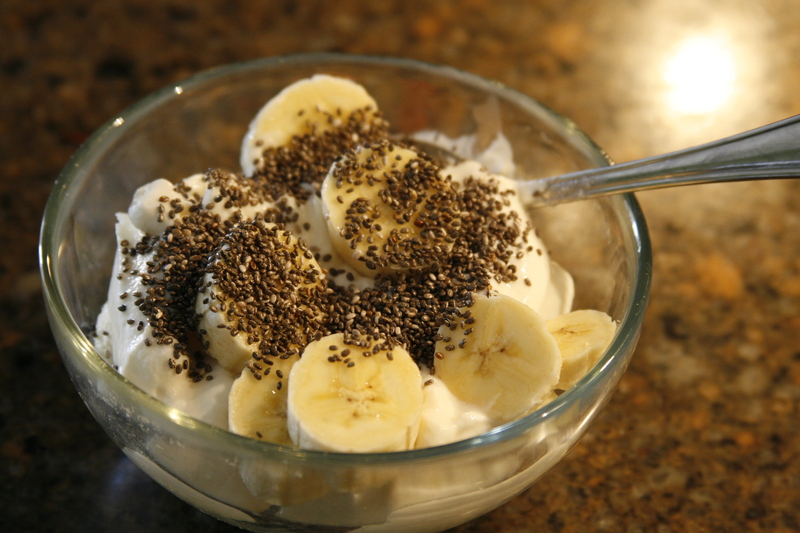 (Photo by Lindsey Gemme) A typical morning delight in my abode… with chia seeds. So – it’s now been over a week since I’ve incorporated these tiny, nutty-flavored seeds into my daily diet. While lauded as one of the world’s best “super foods” (cape not included), I cannot say that I have personally noticed any particular improvement nor any discomfort in having included them into my daily culinary routine. They are supposedly the best for helping one lose weight, as they keep you full for longer (just throw a teaspoon of chia seeds in water, and watch them bloat up in no time. That’s what keeps your tummy busy for a while). And so, according to mychiaseeds.com, weight loss is the number one benefit from these little things. Number 2, is that they help to balance blood sugar. Number 4, full of high levels of anti-oxidants (best known for helping to stave off wrinkles and premature aging), and a great serving of vital omega-3 fat oil. Number 5, they give you an energy boost that helps keep you going throughout your day. Number 6, they are a complete protein…no need to look any further for foods with various amino acids that make up much-needed proteins in our bodies, chia seeds have all of them. While I have not felt any miraculous effects from the seeds’ abundance of nutritional boost they contain, I can’t say I don’t like them. In fact, I took right away to the texture and nutty taste they have. They probably have 101 applications, from throwing them in muffins when baking, to making them into a gel for smoothies. There is even an entire website dedicated to chia seed recipes. A usual daily helping is 1 tablespoon, either all at once or split up over the day. Personally, I have them on salads, and my morning breakfast, which is usually Greek yogurt, and bananas/strawberries. The only thing that doesn’t thrill me extremely well is that I only dare eat chia seeds in my yogurt in the comfort and privacy of my own home. For some reason, they tend to like to stick to the crevices between my teeth, and immediately start to bloat and gel there. Eat breakfast and then run to the bathroom in order to pluck these little stickers from my teeth has become a regular routine for me these days. But aside from that, looking at the chart to the left from http://bestchiaseeds.wegrc.com/, I will probably continue to use them regularly, just on principle. They are very good for you, and probably could save you a bit of money buying some of these other greens and foods on a regular basis.